In this post, I’m going to share with you everything that I did to take my blog content from ‘great’, to ‘freaking awesome’. And, I did this not by producing more content, but by auditing my existing content and making it 100 times better. So, things have been fairly quite around here for some time, and that’s been largely due to the fact that I’ve been flat out busy, more than normal. Not just busy with doing blogging stuff and meeting client deadlines, but also busy working on my own personal projects. As a result, I’ve been left with very little time to actually create new blog content. 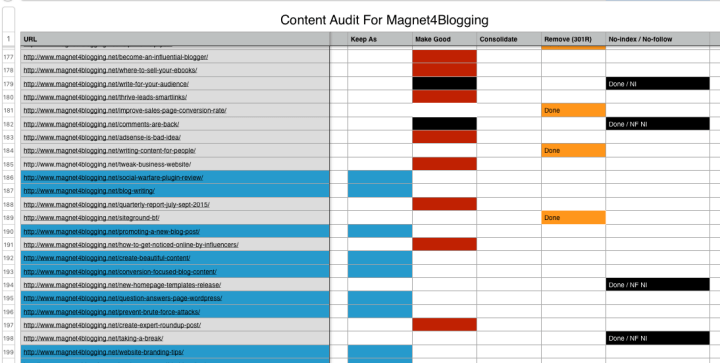 Now, one of the things that I’ve been really busy with over the last six months or so has been auditing all of the content on the Magnet4Blogging Blog. As of now (September 2017), every single post on my blog has been fully revised and updated. Including all of the copywriting on the homepage, about page, landing pages, and various other pages too. Late last year (September 2016), I sat down and began seriously taking a look at my website as ‘a whole package’. I wasn’t really concerned with the design since I was already working on a new custom child theme called Sennen Pro. The one you see that is live today! What really concerned me back then was the content on my blog. How much value does each blog post really provide to my audience? How many posts are actually aligned with my business model? How could I improve the quality of all my blog posts to make it even MORE valuable? I was also coming up to the ‘200 blog posts published’ mark, and almost ’50 active pages’ as well. Spending some time reading my own blog? One weekend, I decided that I would just read a small handful of random posts on my blog. I headed off down to my local Starbucks, laptop in hand, headphones and iPod too, and I spent a good few hours reading my own blog posts and making notes. I made a list of all the things that I thought really needed improving, and here’s what I discovered after reading a few more, and a few more, and a few more posts. Almost all of the content on my blog really needed refreshing. So it begins, I finally decided that it was time to do a full-blown blog content audit. So the planning started in mid September of 2016. Now, if you’re thinking that your blog could do with a complete content refresh too, here’s how I did it. Hopefully by reading the process that I went through to improve my blog content, you will be inspired to audit the content of your blog too. You’ll also learn some of the things you need to do, and tools you need to use. What is a content audit anyway? I’ll assume that you don’t know what a content audit is. If you do, just skip to ‘Why should you do a content audit’. A content audit, in the online world, is best described as the process of evaluating content elements. So, for instance, if you have a blog with lots of content, an audit is the process of evaluating all of your blog posts and all of your static page content, and then making a decision as to what you want to do with that content. Based on a series of measurable factors and how much of your content holds any true value to your blog or website, you may want to delete, improve, or do something else entirely with your existing blog content. I hope that made some sense. If not, you can always read more about it here in greater detail. There are way too many reasons why any blogger or content marketer would want to do a content audit. Well, for me it was about wanting to improve the quality and usefulness of my blog content. And, to make it more aligned with my visions, goals, and of course, my business model. So my advice to you is this – before you start editing posts and deleting pages, first figure out why you really want to do a content audit. What is the purpose of your audit? Most bloggers just want to make their content better as so to improve rankings and increase organic traffic. Now, before I started making any improvements to my blog content, my first task was to identify and remove any thin or low quality articles. In mid October, I decided to remove over 50 low quality articles from my blog, and immediately began redirecting the 404 error pages of those deleted articles to other ‘relevant’ content on my blog. Expired blog contests and giveaways. Reviews of products and services that no longer existed. Link mashup posts and curated content articles. OK, so if you look at the screen capture below, you’ll see that my blog’s organic traffic dipped as soon as I deleted those low quality articles. It stayed low for roughy 2 months before it even started to recover again. 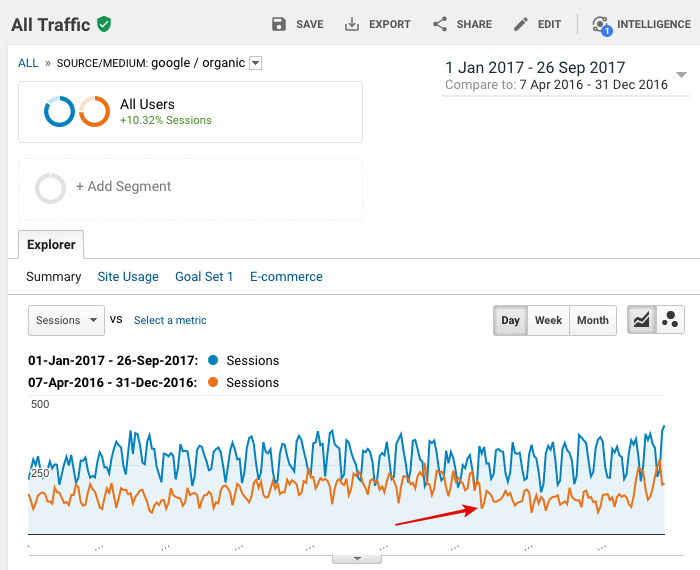 Over the course of my content audit, and up to now in September, organic traffic overall increased by 55%. You see, by removing those low quality articles and making good of the rest of the content helped my organic traffic increase by more than half. Of course, I’ve got to take into consideration that I’ve added a dozen new articles to my blog in that time too. 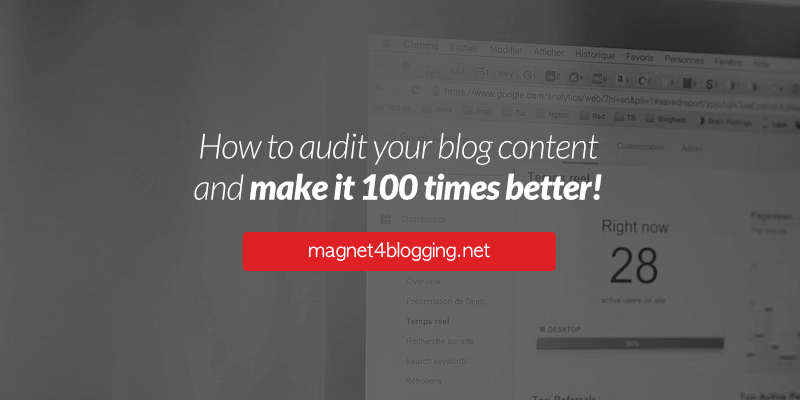 So, if you’re at all wondering whether doing a content audit for your blog might help you to improve your search engine rankings and increase organic traffic, I can tell you that it just might. Right, before I finally share with you my process for doing a content audit (I promise you it’s coming), let me just say something very important to you. 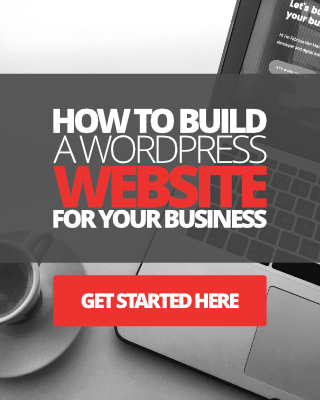 If you’re going to do this for your blog or website too, you need to have two critical things. A freaking good plan of action. Lots of focus and patience, because a content audit is not something that’s done overnight. Seriously, you’ll pull this off successfully only if you are better organised and better prepared, and with a plan of action. And, if you take your time, have patience and don’t lose focus. Now, what ever your reasons are for doing a content audit for your blog, you’re going to need to gather a lot of important data about your existing content. Again, all of this takes a considerable amount of time and preparation, so please, please, please be patient. If you take a look below, I’ve compiled a list of some of the information and data you might want to gather for your website/blog audit. I call this list the auditing factor list. List of all your blog post URL’s (Critical). List of all your static page URL’s (Critical). Content publish date for all blog posts. Remember what I said earlier, it’s about being well-prepared and organised so that you don’t lose focus. It can get, and will get, tedious at best of times, but hang in there. And finally peeps, here’s what I did to execute a successful content audit for my blog. 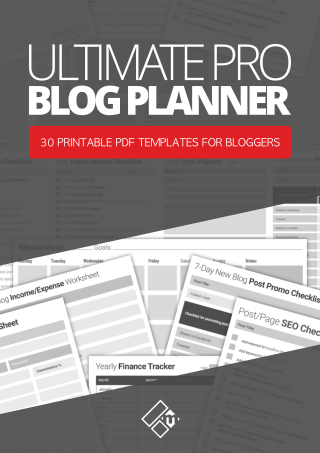 OK so first thing’s first, and that’s to do a full URL dump of all the pages and posts for your blog or website into a spreadsheet. When I did this for my own blog, I did not include categories and tags. I didn’t think it was necessary to add more work to my content audit, however it’s entirely up to you. So, you’re probably wondering how do you find all the URL’s of your blog posts and pages? Well, I used my blog’s sitemap to find all of mine, and I added them all to a spreadsheet manually. This was very tedious and time-consuming to say the least. 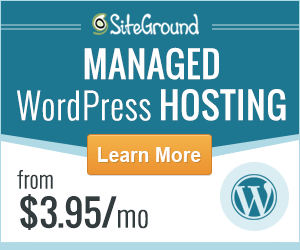 If you have an XML Sitemap generated for your WordPress site, you can do this too. If you don’t yet have a Sitemap, install the Google XML Sitemaps plugin. If you’re using WordPress SEO by Yoast, there’s a Sitemap feature included with this plugin you could use. 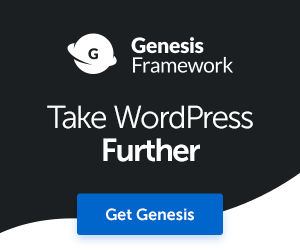 What if I don’t use WordPress, or don’t want to generate a SiteMap? 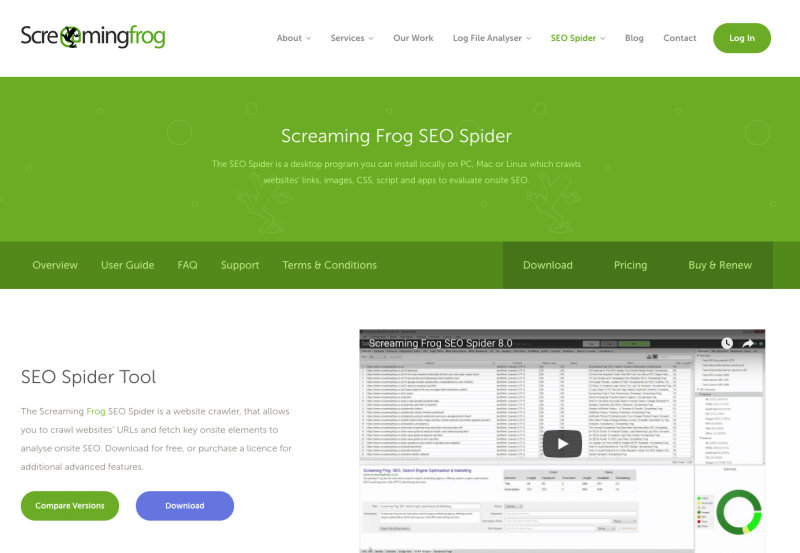 If you don’t use WordPress, or even if you do, to save a huge amount of time, there’s a great tool you can use via the Screaming Frog web app. The free version of the SEO Spider Tool will allow you to crawl up to 500 URL’s. Click here to access Screaming Frog. After finding all the URL’s using Screaming Frog, you can then export them to use in a spreadsheet. OK, so going back to dumping your URL’s, I used Numbers Spreadsheet for the Mac to do my URL dumping and organising. You can use what ever tool you feel most comfortable with using. If you are a Windows user and have access to Excel, for instance, you can use that. You can also use Google Sheets to create your spread sheet. Here’s a snap shot of what my URL dump spreadsheet looked like. Pretty basic stuff, right? Now that you have all our URL’s in a spreadsheet, it’s time to start organising them. Here’s what I did again. First, I put all the URL’s in one column under the heading ‘URL’s’. Next, I added some categories. Using categories will help you make a better decision as to what to do with each blog post or page you audit. I added the following categories to my URL dump spreadsheet. Again, you can follow the same process as above, or add your own set of categories. Let me dive deeper into each of the categories above and explain their main purpose. This category is for any evergreen content that I have on my blog. It is for the articles and pages that don’t need much adjusting, and articles and pages that are already ranking well and getting good amounts of organic traffic. In this category I would add all the URL’s of posts and pages that needed vast improvement. These would include posts and pages that were getting decent traffic and had good search engine rankings, but had poor conversion rates. All the URL’s of posts and pages on topics that were more or less the same would be dumped into this category. I would then find a way to combine these articles together to create more in-depth, long form, search engine optimized blog posts. In this category I would place all the URL’s to pages and articles that clearly needed deleting. These would include ‘thin content’ posts and pages that offered no value to my readers, and received no traffic, no comments, no engagement, and no conversions. To avoid creating too many 404 error page-not-found errors, I added 301 redirection to each post I removed, so that they would point to another relevant and related piece of content on my blog. If there wasn’t a related post I could redirect to, often I would just redirect to the blog archive page, or my Sitemap page. I also use a custom-built 404-error page on my site which helps users find the page they’re looking for quickly. This category would be reserved for posts and pages that had no right to be deleted. These would be long-form blog posts such as interviews with bloggers and influencers, cornerstone posts, case-study articles that all attracted a lot of comments, shares and engagement in their time, but now no longer received much in the way of traffic. I would make these posts good again, keep them as no-index, and maybe promote them again from time to time. So, as you can see, by simply adding categories like this, it makes the whole process of auditing blog content much easier, but not necessarily quicker. If you’re going to make, and use, a URL dump list for your blog’s content auditing, go through each piece of content with a fine-tooth comb, and again, take your time. I can’t stress enough on how important it is to take your time with this. Yes, it’s going to be extremely time-consuming and tedious going through each individual post, reading line for line. It’s not a quick process at all, but, it will all be worth it in the end, trust me. Go through each post with your list of auditing factors close by. Once you’ve successfully gone through a piece of content, place it in the relevant category. When I performed my content audit, I was spending anywhere from 30 minutes to an hour auditing each post or page on my blog. Even longer if I had to upgrade some of them with new content, new images, screencaptures, videos, and everything else. Tip: Set yourself a daily minimum goal. I set myself to audit a minimum of 4 posts per day, just so that I wouldn’t get board stiff doing it. Don’t forget that as you go through each post with a fine-tooth comb, to evaluate some, if not all of the auditing factors I shared with you at the start of this post. Put each post or page in the category you think it should be in, based on the data and information you gathered and analyzed. If you wanted to, you could start with the most popular posts on your blog and work backwards. Numbers for the Mac (For Windows use Excel, or Google Sheets). Google Analytics with the MonsterInsights Analytics plugin installed. Google Webmaster Tools (For tracking any 404-Error pages). Social Warfare (For showing social share counts per post in post admin). WordPress SEO by Yoast (For managing Robots settings for posts). Heatmaps (You can use Clicky Web Analytics or SumoMe). LongTailPro (For analysing page authority and page links per post). So there you have it, a detailed breakdown of how I carried out a successful and painless content audit for my blog, and how you can do the same too. You don’t have to be an experienced marketer to do this. I did this for my own blog with zero knowledge or experience, so if I can do it, so can you. It really helps, though, if you take some time to research, learn, watch a few YouTube videos on how to do content auditing before you start.